Refrigerators have become an important appliance in every household. They run 24 hours without a break to keep the items cool and fresh. This can lead to several problems in the machine and cause malfunctioning. So, consider our name when in need of a firm providing repair, modification and maintenance services for all makes and models of refrigerators. Blessed with a team of skilled individuals, we assure on time and cost effective repairing solutions. At Max Appliance Houston, we are one of the most trusted service providers for refrigerator repair in Pearland and freezer repair in Pearland. Offering fridge repair in Pearland, Texas for all brands and models of refrigerators has given us hands-on experience. Now, we can diagnose any problem in the working of your refrigerator to provide the best solution for refrigerator repair. Contact us anytime to book a visit from our certified technicians. So, whenever you seek repairing assistance at your place, ring us on the given numbers. 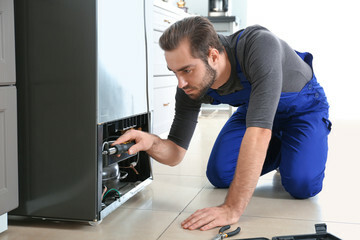 We provide on-site solutions for refrigerator repair in Pearland/ freezer repair in Pearland/ fridge repair in Pearland. The fee we charge for our services is reasonable; so contact us anytime. Clients can browse our contact us page and reach us anytime for a detailed discussion.